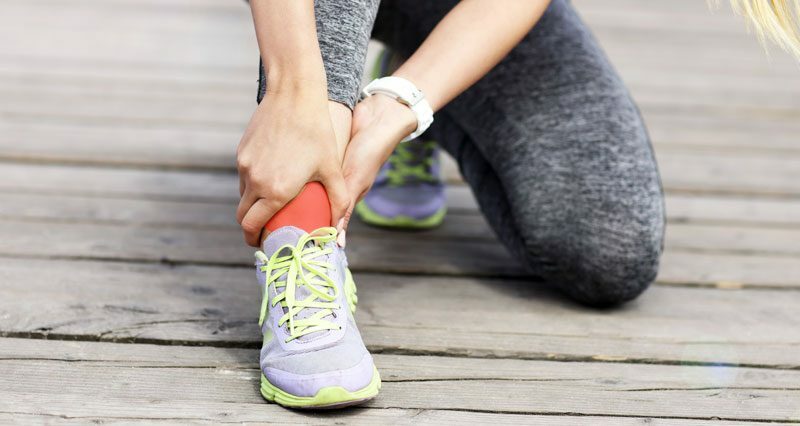 Pain at the front of the ankle, which has come on gradually rather than from a sudden twisting or trauma, is usually due to impingement or tibialis anterior tendinopathy (tendinitis). 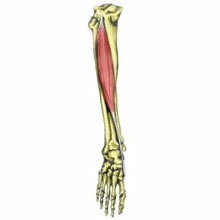 The tibialis anterior muscle is the large muscle that runs down the outside of the shin. It controls the movement of the foot as it lifts the foot up and inwards. Inflammation of the tendon sheath can cause pain at the front of the ankle, particularly when bending the foot and toes up. Symptoms include pain when bending the foot and toes up. There may also be swelling and redness over the front of the ankle where the tendon is. If you push your fingers into the tendon you can sometimes feel a creaking when you move the foot up and down. Treatment is to rest and apply the PRICE principles until there is no pain. After the initial inflammation has settled down, apply heat and use a heat retainer. Put padding into the shoe if the shoe is pressing on the tendon or aggravating the injury. Identifying possible causes such as training methods or foot biomechanics should be done. A doctor may prescribe anti-inflammatory medication e.g. ibuprofen and advise on a full rehabilitation program. They may apply a plaster cast if the injury is severe, although this is rare. Read more on Tibialis anterior tendoninopathy/tendon sheath inflammation. Ankle impingement is when a bony growth at either the front or back of the ankle bone restricts normal ankle range of motion. Impingement means tissues have become trapped between bones. This injury occurs where the ankle bone meets the shin bone, and often follows a sprain that hasn’t fully healed. Ankle impingement can be anterior affecting the front of the ankle or posterior impingement affecting the back of the ankle depending on where the bony growth occurs. 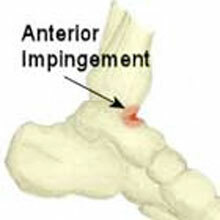 Impingement can often occur following an ankle sprain which fails to heal properly. Symptoms include pain felt at the front or side of the ankle which does not go after an ankle sprain heals. The ankle may seem weak and one giveaway sign is reproducing pain by forcing or passively moving the ankle into dorsiflexion or pointing the foot upwards to stretch the muscles at the back of the leg. Pain is usually felt at the back of the ankle. There will be tenderness behind the bottom tip of the fibula bone. Pain will most likely be worse at the end of the movement when the foot is pointed down into plantarflexion with the foot pointing downwards. Going up onto tiptoes may be painful. An X-ray can show up any bony spurs on the talus (heel bone) and end of the tibia (shin bone). Tissues in the ankle joint can become trapped between bones in the ankle. This is known as impingement and occurs when the ankle is bent fully up or down. Posterior impingement in the back of the ankle is more common in ballet dancers and can be due to a bony protrusion at the back of the ankle. Anterior impingement (at the front of the ankle) can occur from a bad or repeated ankle sprain as the ligaments thicken and get pinched between the bones (tibia and talus bone). As the torn or ruptured ligament heals, the body forms too much scar tissue along the front and around the side of the ankle joint creating a meniscoid lesion. Rest for up to 4 weeks. A plaster cast or splint may be fitted to restrict movement of the ankle. Cold therapy or ice can be applied to reduce pain and inflammation. A doctor may prescribe NSAID’s (nonsteroidal anti-inflammatory medication). If conservative treatment does not work then surgery may be considered. Footballer’s ankle is a bony growth at the front of the ankle where the joint capsule attaches. It can follow an injury where the ankle has been overstretched or over bent. Moving the foot up and down will often be painful, as will kicking a ball. Surgery may be required if the ankle injury is severe. Symptoms include pain and tenderness when pressing in with the fingers over the front of the ankle joint. The patient may feel pain when bending the foot up or down. A typical symptom is a band of pain across the front of the ankle when kicking a ball. There may also be a bony lump at the front of the ankle. If the bony growth is large enough, nothing the athlete can do is likely to help and surgery may be required to remove it. See a sports injury professional who can advise on rehabilitation. If the injury is more recent or less severe then it may respond to a rehabilitation program consisting of mobility, stretching and strengthening exercises. Wear ankle support to encourage blood flow, warmth, and compression. A professional practitioner might apply sports massage techniques to mobilize the tissues at the front of the ankle. A doctor can administer a steroid injection followed by complete rest. An X-ray of the ankle can confirm the diagnosis. Once pain has gone a full ankle strengthening and mobility rehabilitation program should be undertaken to restore the ankle to full function.